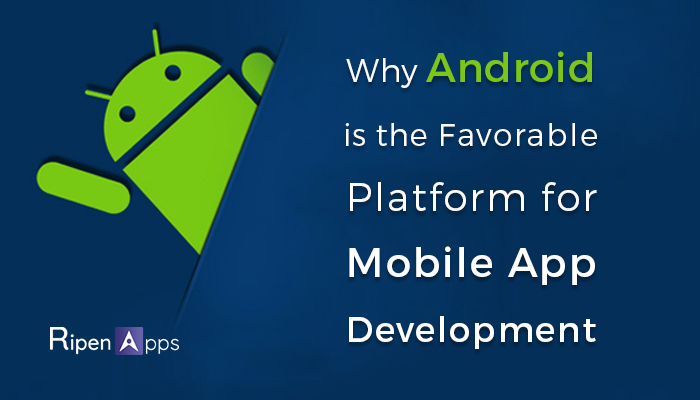 Why Android is the Favorable Platform for Mobile App Development? Right from the inception of mobile applications, Smartphones come in huge demand. With the immense growth in the technology, the tech world has been continually growing, and innovations have been taken speed in growth. This innovation has given speed to mobile app development process as well. If we talk about mobile apps then, apps are like lifeblood for Smartphones. Without apps, Smartphones are nothing but a dead part of the body. Do you use Smartphone? But obviously, you do! In this world of technology, almost everyone wants to get digitalized & tech-giant. We believe that there must be various apps are on your mobile phone. Apps which you use for multiple purposes like for booking the cabs, ordering food, shop anything and almost for every on-demand services. This way, mobile apps provide pavement and makes our daily lives easy. Beside this practical fact, if we talk about statically then there are almost 2.1 million apps are there for the Android users, and nearly 2.0 million apps are there for the Apple users. Gartner survey proves that around 26 million devices will be connected by the year 2020. And the medium of connection would be the mobile apps. On average counts, there are approximately 50 to 90 apps in each Smartphone. Around 3 hours spent on mobile apps by each Smartphone users and expected to grow more by 2020. Okay! This was all about the significant place of mobile apps holding in our life. Now let us talk about why most of the mobile app development companies are opting Android app development for their on-demand app development. Before moving further, know what on-demand app is and what their importance in our daily lives. All the apps that are needed to resolve the daily basis requirement are known as on-demand apps. Technically On-demand apps are nothing but an arbitrator between the user and a service provider. To avail, the services from the service provider were quite complexed in the previous time. Now for the ease of the users and the growth in the businesses, on-demand mobile apps come up as a boon. As the cities are expanding, the world is increasing; on-demand apps are making the path for availing the daily basis needs in their busy schedule. On-demand apps can be made by using any of operating system whether Android app development, iOS app development or other but Android comes as the most favorable choice of mobile app developers. As specified previously, Android has outpaced every one of its partners like Apple and Windows with a decent edge in a piece of the overall industry. Large portions of the Smartphones have an Android OS. That is the significant reason, organizations serving end users on-demand premise, favor building on-demand applications in Android as it has a tremendous crowd. If you come under the category of on-demand app development, then you must be aware of the fact that it requires many updates timely in building an on-demand mobile app. This is because of frequent changes comes in the user’s mind. If we compare Android with another operating system, then Android provides extra easy customization. To develop an on-demand mobile app, it requires including lost for essential functions like Maps, Navigations, GPS functionality, etc. Android offers more features in comparison to another operating system. Due to the precious nature in offering the Data storage space, Android has offered cross-platform app support along with the 15GB data storage capacity free. It is necessary for all the On-demand apps to offer the timely notifications so that the user gets updated every minute. The Android operating system is rich in providing and handling the notifications from one single app. When it comes on on-demand apps, it is necessary that they are duly available on the various languages because most of the apps come in the B2C category. While, when it comes to languages, Android supports more than 100 languages than another operating system. On-demand apps are in demand these days due to the busy schedule of everyone for most of the things. By observing lots of popularity of on-demand apps, many mobile app development companies are looking forward to building a mobile app for enhancing their business. Android has stolen the eyes of the app developers due to its rich features & popularity over others. For more details, contact us on info@ripenapps.com.